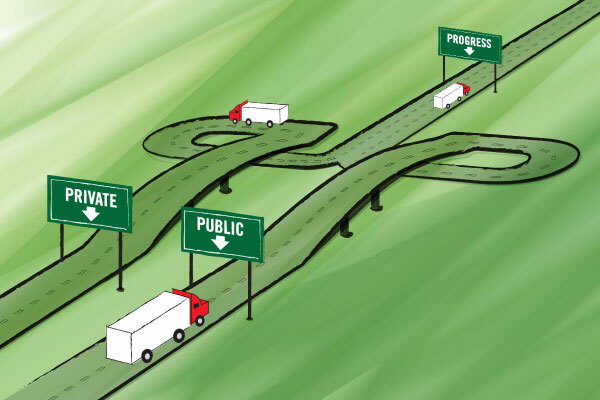 Can public-private partnerships transform America's ailing transportation infrastructure? Many of the roads, bridges, and transit systems that freight travels on each day were built decades ago, paid for by previous generations. Many more have outlasted their original design life and need to be repaired or completely rebuilt. The wear and tear we put on U.S. infrastructure is tremendous because we are a more prosperous and mobile country than we were when these systems were built. It will take more than $2.3 trillion over the next five years to elevate U.S. transportation infrastructure to an acceptable level, according to American Society of Civil Engineers estimates. Following decades of under-investment, the federal stimulus plan was meant to disperse an estimated $50 billion to transportation projects based on proposals submitted by each state. As of June 2009, 1.2 percent of the stimulus funds were used for such projects, according to an October 2009 report from Business Monitor International (BMI) and the U.S. Department of Transportation. In an effort to find more creative ways to fund transportation projects, state and local governments are turning to public-private partnerships (PPPs or P3s), government service or private business ventures funded and operated through partnerships between government and one or more private-sector companies. These agreements involve a contract between a public-sector authority and a private party, in which the private party provides a public service or project and assumes substantial financial, technical, and operational risk. When construction on the Interstate Highway System began in the 1950s, there were 65 million vehicles traveling 600 billion miles annually. Now there are more than 240 million vehicles, and they travel more than 3 trillion miles every year. 33 percent of America's urban and rural roads are in poor, mediocre, or fair condition, according to the Federal Highway Administration. As of 2003, 27 percent of the nation's 160,570 bridges were structurally deficient or functionally obsolete. Driving on roads in need of repair costs U.S. motorists $54 billion per year in extra vehicle repairs and operating costs—$275 per motorist. Outdated and substandard road and bridge design, pavement conditions, and safety features are factors in 30 percent of all fatal highway crashes. Road use is expected to increase by nearly two-thirds in the next 20 years, making transportation infrastructure improvements crucial. The tremendous scope of this need, and the funding required, has inspired the growth of public-private partnerships. Port EvergladesElectriCities of North Carolina, Inc.Hoosier EnergyRinchem Company, Inc.